Japan's calamitous macroeconomic policies dating back to the 1990's are again wreaking havoc on the Japanese economy and the Yen. 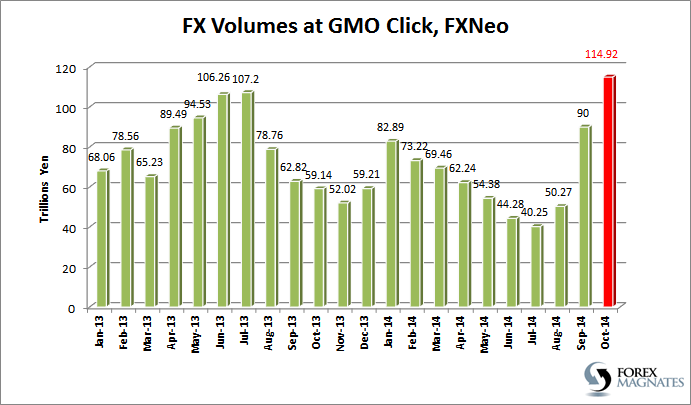 A market leader amongst Japanese brokerages, GMO CLICK Securities has just published record-breaking Forex trading volumes for the month of October, transacted via the company’s over-the-counter FX trading platform, FXNeo. GMO reports a 28% increase in trading volumes in October, reaching an all-time record of ¥114.92 Trillion (~$1.01 Trillion US dollars). Year-on-year, GMO has achieved a 94% increase in trading volumes since last October’s ¥59.14 Trillion (~$500 Billion) result. The number of new client accounts added in October was almost 5,000, a 1.4% increase. Last month, GMO Click issued an announcement detailing its fiscal 2015 second quarter results with net operating revenues at ¥9.8 Billion ($45.3 Million). Undoubtedly a catalyst for the sharp doubling of FX volumes since August are a series of key market events surrounding Japan and the yen over the past few months. Already in August, Japan’s ‘Abenomics’ policy was facing criticism as macro-economic indicators such as inflation and economic growth were failing to meet their highly optimistic targets. Japan’s monetary policy has remained accommodative in the extreme leading to a watershed moment last week. The sharpest daily decline in yen pairs since April 2013 was precipitated by an unexpected Bank of Japan decision to raise its targeted annual monetary base expansion by ¥10-20 Trillion from the ¥60 Trillion base already in place. The inclusion of equity linked products in the BoJ QE basket has also helped to spook investor confidence in the yen. Debt monetisation is a touchy subject currently facing most central banks, although Japan is more aggressive in this respect compared to other G20 central banks. With the Japanese yen losing more than a third of its value due to Bank of Japan stimulus measures, not to mention the numerous artificial intervention efforts to purposefully weaken the yen in favour of Japanese exporters, a glaring question must surely be asked: Is Quantitative Easing Worth It?